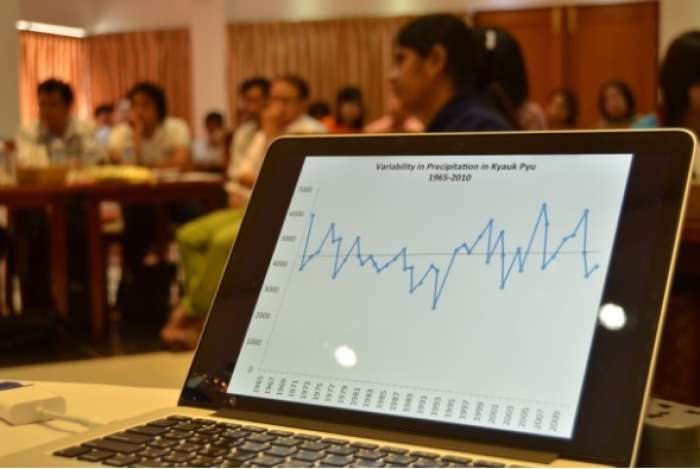 In most places in Myanmar, villages receive an average of 95% of their annual rainfall from the South West Monsoon period between May and September. Situated along the Bay of Bengal on the East coast of Myanmar, Leik Tin’s farmers are reliant on this rainfall to grow rice during the monsoon season. However, recent unpredictability of this usually welcomed rainfall, in combination with high tides and warmer and drier hot seasons, is presenting communities with serious problems. Higher intensity rains combined with high tides and coastal flooding in Leik Tin has been threatening paddy crops in recent years, bringing saline water into the fields, according to the The Village Disaster Management Committee (VDMC), a community based organization in Myanmar. The community has also been experiencing warmer and drier hot seasons affecting the availability of drinking water in the village ponds. Another village, Sue Yit Tan in the central dry zone of central Myanmar in Meiktila Township, has also been facing challenges resulting from increasingly unpredictable rainfall and water scarcity. The village has also suffered from high salinity of many of the newly dug water wells. As a result, the community is finding it increasingly difficult to access sufficient drinking water and water for irrigation during the dry months. The underlying drivers of vulnerability in the Leik Thin and Sue Yit Tan, Zayar Thiri and Thar Yae Aye communities and what kinds of climate extremes and disasters (i.e rapid and/or slow onset) the communities are exposed to was assessed using the Community Resilience Assessment and Action Handbook developed by BRACED to explore these questions. This assessment method looks at how different people (men, women, boys and girls) are affected by understanding the different sensitivities within the community. The residents of Leik Tin have been tackling the enormous weather challenges by working on assessment, prioritisation and implementation plans under the guidance of the BRACED programme. Incorporating scientific evidence into their decision-making, Leik Tin and other communities generate ideas on how to deal with multiple hazards, including short-term and long-term solutions. In one village, building canoes was a simple solution to keep communities afloat amidst the various hazards of climate change. Villages also focus on longer-term solutions to build resilience to climate stresses and shocks. future climate projections and scenarios. Strengthening the skills required to be able to interpret this information is crucial for decision-making. Better access and understanding of climate and weather data, forecasts and predictions means that communities can base decisions on current understanding, in what is known as evidence-based decision making. Improving communities’ access to accurate climate and weather information will help them plan their seasonal planting, diversify their livelihoods options, and better prepare for disasters such as flooding by protecting their assets on time. As a result of the resilience assessment, the BRACED Alliance target communities have started prioritising key resilience measures that will support five key areas of change identified for Myanmar. In the township of Mawlamyine, these two critical processes resulted in building canoes! The communities prioritised the construction of canoes to be better prepared for annual flooding. Access to canoes can save lives during floods and improve access to water and food for communities during these events. A simple, local solution to a complex, global climate and weather hazard.